Inaugural ceremony of the workshop. Addressing the audience is Dr. Abha Mishra. Sitting from left to right: Dr. Eden Y Woon, Mr. Jerome Pons, and Dr. Amir Kassam. In comparison with pre-project baseline performance, SRI practices helped improve livelihoods across the Lower Mekong River Basin (LMB) by increasing average rice yields by 52%, farmers’ net economic return per hectare by 70%, labour use efficiency by 64%, and water productivity by 59%. Total energy inputs required for farming operations decreased by 34%, along with significant net reductions in greenhouse gas emissions. 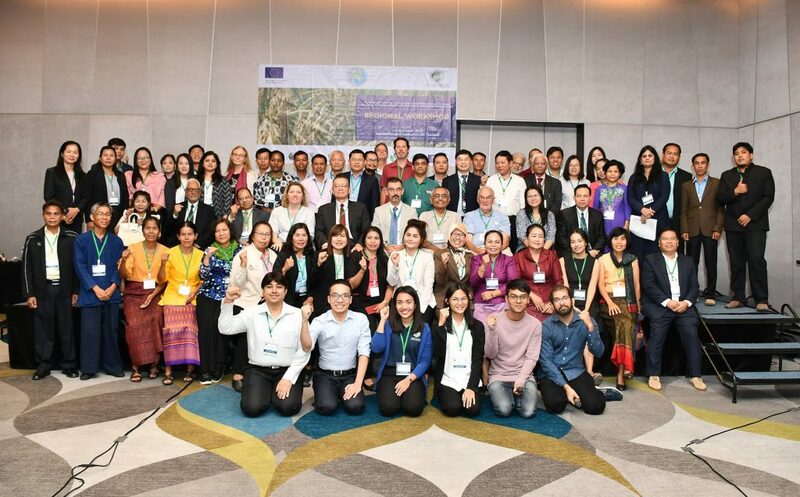 These results were reported at a regional workshop of the SRI-LMB project held at Novotel Sukhumvit, Bangkok on November 1-2, 2018. The results were reported from 582 research sites spread across 33 districts in eleven provinces of the four countries, all as a part of a regional project led by the Asian Institute of Technology with funding support from the European Union with a total cost of action of €3.4 million. “The intensification of smallholder agriculture, with its emphasis on diversity, synergy, recycling, integration into the global economy, and social processes that value community participation and empowerment could be one of the viable options for meeting present and future food needs. 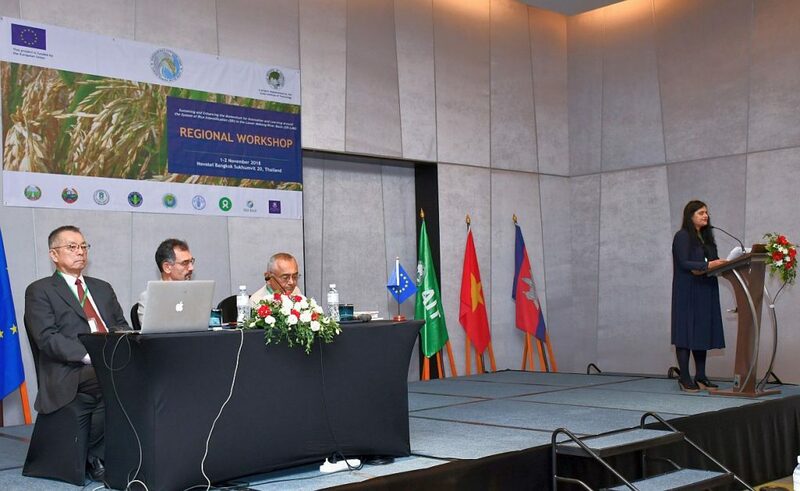 More particularly, with recent developments in the climate change debate as well as the Paris Agreement and with stated policy on ASEAN food security, the relevance of SRI-like work has become more central to regional needs for sustainable development,” said Dr. Eden Woon, AIT President, while delivering the inaugural remarks. “The SRI-LMB has facilitated the development of informal farmers’ groups in 11 provinces across all four countries by engaging 15,000 farmers in trials and adaptation of new ideas, plus (less directly) 30,000 farmers over the past five years. These groups, if strengthened further, can provide a basis for developing farmer organizations that can accelerate sustainable rice intensification and diversification along with market development for smallholders. So it is important to incentivize them in their climate-smart practices and to offer them opportunities to become ‘agripreneurs,’” says Project Manager Dr. Abha Mishra, Director, Asian Center of Innovation for Sustainable Agriculture Intensification (ACISAI) at AIT. “The European Union is committed to the achievement of the world’s Sustainable Development Goals (SDGs) and, in particular to the eradication of poverty and hunger. This project is helping small-scale holders, women in particular, in the Lower Mekong Basin countries to have sustainable livelihoods. This is done by using innovative techniques to increase productivity, and generate more income and, at the same time, to reduce the impact on the environment, thus making rice cultivation more sustainable” says Mr. Jerome Pons, Head of Cooperation at the European Union Delegation to Thailand”.